How adoroable is the HuggleHounds Long and Lovely Lion? I know that you can't help but smile when you see his bright colored polka dot body and floppy lime green mane. With five - yes five! - squeakers inside his body, your dog will be smiling too. HuggleHounds are snuggly, durable and fun - not to mention some of the Lapdogs' most favorite toys (Lola is infatuated with the seatbelt spider and Sophie loves the bottle monkey)! HuggleHounds was started in 2009 by Bob Flynn and Julie Krauss, who combined have over 40 years experience in the pet industry. They built their company on two simple philosophies; to be easy to do business with and to bring unique, innovative and quality pet products to the marketplace. Every product is designed for HuggleHounds by HuggleHounds. HuggleHounds are made for dogs who like to have fun - like Bob and Julie's own pets, Buddy and Salem. Buddy is a 120 pound Goldendoodle who loves to test every product. He is strong and dedicated to trying to destroy every toy they give him. Salem is a retired black Labrador Retriever who loves to wake up every morning with a smile on her face and immediately put a toy in her mouth (sounds like Lola). She works in the office everyday reviewing HuggleHounds product quality. HuggleHounds uses a special patent pending Tuffut Technology for their toys. Their slogan? "Go Ahead... Chew Me... Dare You!" 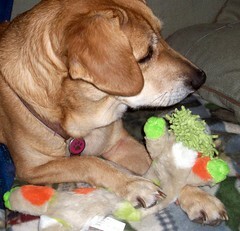 With 4 tough chewers in our household, toys that last are certainly important. The Tuffut Technology uses three special bonded layers that essentially provide body armour to protect the toy. An outside, middle and inside layer are stitched together with a specially developed heavy duty thread, using up to 65% more stitches per inch to form a tight seal. Reinforced strees point seams add additional toughness - external seams can not be easily opened by aggressive chewers! Tuffut Technology has been tested to withstand over 100 pounds of tugging and pulling. 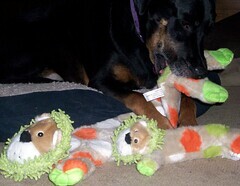 The Lapdogs now have five HuggleHounds toys in their collection, two of which are the Long and Lovely Lions. Not one of them has been torn, ripped or destuffed in any way! They have been playing, tugging and cuddling with two seatbelt spiders for at least 8 months, a bottle monkey for 3 months and the two Long and Lovely Lions for 2 months. Not one shows any signs of destruction, with the exception of a dead squeaker or two. 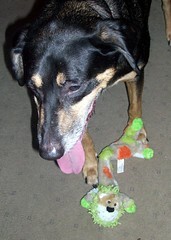 The Lapdogs love to play with their HuggleHounds and I love that the toys are standing up to all 4 of them! The Long and Lovely Lion is just one of the many plush toys available from HuggleHounds. Convenient for dogs of all sizes, Long and Lovely Lion is available in a Mini (15"), as well as an Extra Large (26") version. They are machine washable. 2) Leave a comment here telling me how tough your 4-legged chewer is. Also, please indicate which size (mini or extra large) you would like if you win. Deadline for entries is Thursday, October 7 at midnight. Love all the photos! What great toys to stand up that long! Love the name HuggleHounds too! too cute! My grrrls are not as destructive as my boys. I'd say they're still tough, but not ULTRA tough. I just found your site! Happy Day. I would like an extra large HuggleHound if I should win. We have 5 dogs - - that size would be just right. Thanks. These look great! When I first brought Rava home from the shelter I gave her a cloth toy. She ripped it to shreds within seconds! I told my husband that we couldn't afford to keep her in toys. Then we found a duck that she couldn't destroy and before we left for Japan I bought a dozen of them just in case. Then Tawny came in the picture. 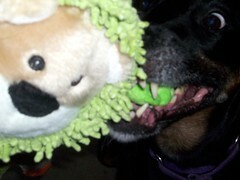 Her favorite toy is a green plush dog with six squeakers. They usually last around three months. When she gets in the shop every morning, the first thing she does is run into the office and chew on green dog. I think she'd love a HuggleHound. Those are some great toy testimonials by the Lapdogs! Cute toys, too. Not sure Thor will love 5 squeakers, though; he pulled the squeaker right out of the lobster G sent him, and now he just packs that sucker around! Well People don't always believes it because they take one look at me and see my delicate softer lady side, but honestly I am the toughest chewer in the whole wide world!! Just wait until you see the dino bone I am getting for my birthday!! I just stopped by from the Blog Hop. Those toys look great. I don't see why cats wouldn't love them too. These look like great toys for my pack. I have a couple of aggressive chewers, but I also have several who just like to carry their 'baby' around wherever they go. We would need a large size. As the babies (they're 6 but mah baybees!!!) have gotten older they're not such entusiastic chewers. They don't destuff anymore so we'd like the small one if we won. We would love the extra large! Haylie is a level 10 out of 10 on the chewer scale - she has labra jaws - jaws of life!